Modular electronic products are often referred to as a strategy to promote long service lives, greater product commitment, and lower resource consumption. The article by Marina Proske and Melanie Jaeger-Erben in the “Journal of Cleaner Production” uses the example of a smartphone to look at various potential modularity concepts at a glance: their functionalities, their influ ence on the human-object relationship and their LCA. It combines engineering and social science perspectives. The contribution can be downloaded here until 8 May free of charge. From the 8th -10th of November, the second conference “Product Lifetimes and The Environment” (PLATE), took place at the TU Delft. The junior research group OHA was strongly represented, with, inter alia, several presentations. Florian Hofmann, Max Marwede, Nils Nissen und Klaus-Dieter Lang: Circular added value: business model design in the circular economy. Melanie Jaeger-Erben und Marina Proske: What’s hot what’s not: the social construction of product obsolescence and its relevance for strategies to increase functionality. Furthermore, in occasion of the “Disruptive Innovation Festival” hosted by the Ellen McArthur Foundation, the interview session “Ever-faster-ever shorter? 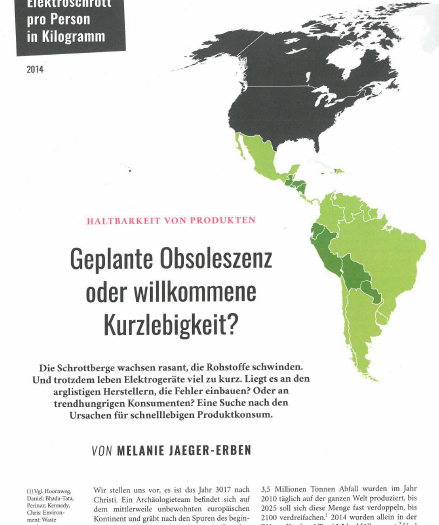 Is planned obsolescence real?” was recorded with the participation of the OHA member Melanie Jaeger-Erben (minute 11:07). We are glad that the PLATE 2019 will take place in Berlin. The event will be hosted by the Fraunhofer IZM in cooperation with the TU Berlin and strong support from OHA. The majority of the German population assesses stability, durability and robustness in electronic devices as more important than new product versions and functional updates. This was confirmed by our representative online survey including 2.000 participants aged between 14 and 66, conducted in July and August 2017. As a part of the study, we examined expectations and experiences with usage and lifetimes of electronic products focusing smartphones and washing machines.